The Atlantis crew, from left: commander Chris Ferguson, pilot Doug Hurley, mission specialists Sandy Magnus and Rex Walheim. 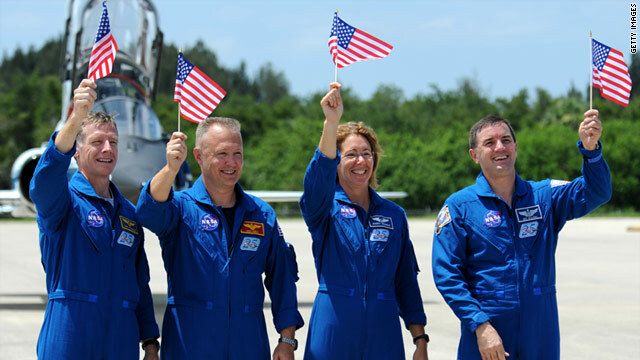 (CNN) - The four-member crew that will fly the final space shuttle mission to end an era arrived Monday at Kennedy Space Center in Florida. Commander Chris Ferguson, pilot Doug Hurley and mission specialists Sandy Magnus and Rex Walheim flew in on two T-38 jets to begin final preparations for the flight on space shuttle Atlantis, scheduled for liftoff at 11:26 a.m. Friday, according to the NASA website. "I think I speak for the whole crew in that we are delighted to be here after a very arduous nine-month training flow, and we're thrilled to finally be here in Florida for launch week," Ferguson said before the four crew members were transported to the Astronaut Crew Quarters.